Birthdays can certainly be tough: the tension, anticipation, crazy Aunt Zora with her food “allergies” – but one thing you don’t have to worry about is producing the perfect dessert. 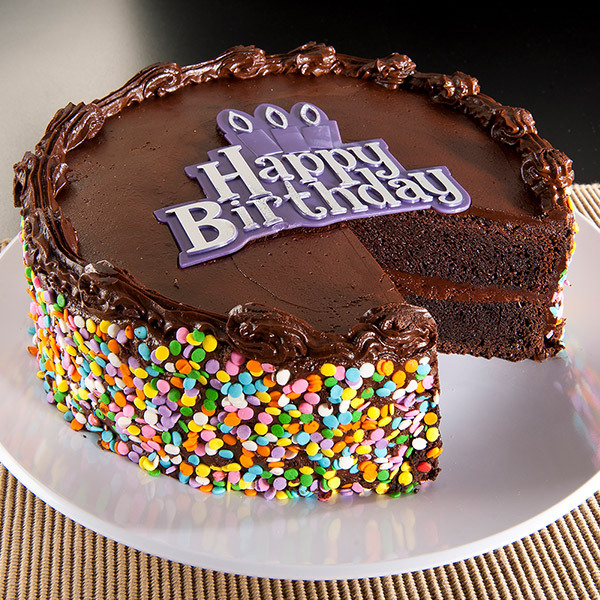 This delicious Chocolate Happy Birthday Cake is made with rich, chocolate cake and topped with our savory, lush chocolate frosting. So, ease the b-day nerves with this delicious cake that everyone (even Aunt Zora) is sure to enjoy. GREAT TASTE AND SURPRISED MY SON WHO IS IN COLLEGE. Bought this cake for my sister - arrived a day early on dry ice and was ready to eat on her actual birthday. She shared with co-workers and was very happy with the quality. My Sister "put a hurting" on this cake. Next year I'll have to order two!! It was almost too pretty to eat! But from first bite to last is was delicious! Delivered on time, tasted great.. Would defo use again!!! Your website was the first one that I came across that would send to a college campus. Grandson received it on the day requested and said it was a really good cake too. This is the 3rd time I bought this cake for my daughter who lives far away. GREAT tradition!!! Cake arrived on time and nice and cold- my son was so excited to receive it for his first birthday away from home (freshman @ Gonzaga). Could not have worked out better! !